…I had been looking for solutions to the high cost of CRT display terminals for use with Community Memory, which had opened its first walk-up bulletin-board terminal in August of 1973. I had designed a modem that would work at 300 baud (signal elements per second) but the terminals were still a prohibitive $1500 each. 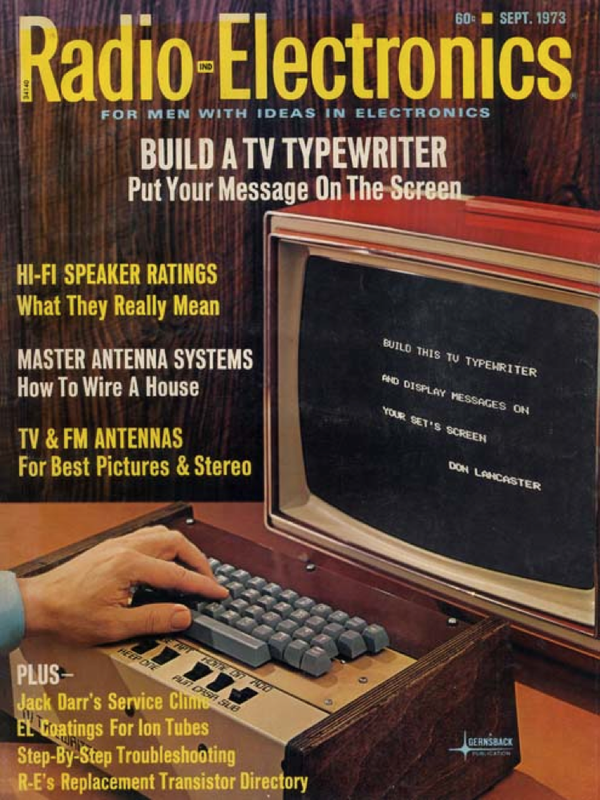 In September of that year a build-it-yourself article titled “Build the TV Typewriter” appeared in an electronic hobbyist magazine – the cover showed a picture of a box that contained a keyboard and produced a signal that could be fed to a TV set so that 16 lines of 32 characters would be displayed as if by magic. While the publishers assumed there would be about 20 requests for plans (which were too extensive to print) over 10,000 readers sent in $2 and an envelope. Clearly something was going on! Bob Marsh was one of those respondents, and had with great difficulty built up a partially-functioning TV Typewriter. I examined its performance and noticed that it had a fundamental flaw – it couldn’t be used as a computer terminal. This was because the display would flip from one “page” to the next when the screen was full, clearing the screen and resuming the display at the top. Thus a user had almost no time to see the entire screen’s worth of text before it disappeared. 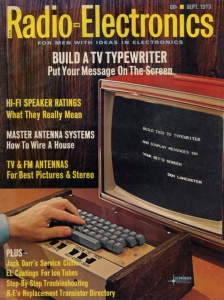 I called up Don Lancaster, designer of the TV Typewriter and asked why he had built it that way. He said, “I don’t know – people just want to put up characters on their TV screens” – he had never considered the problems of using it as a terminal. Lancaster then told me that he was working on a next version of TV Typewriter using random access memory chips (the first version used the more available but difficult-to-use shift-register memories). I then began to lay out the design for a display terminal like the TV Typewriter but intended to develop into a personal computer. It was modular in design – new circuit boards could be plugged in to expand it. It started out with enough memory (1024 bytes) to support the data for a display screen. On other boards were the display timing board and the input/output board. The first board would read the memory repetitively and convert the ASCII data into dot patterns for characters and symbols, thus “refreshing” the CRT display fast enough to avoid flicker. The second one would connect to the keyboard and serial data line from the computer and place characters into the memory in the right positions. Most importantly, the location of the displayed character on the video screen would map directly from the address of the memory location holding the code for that character. This was the “memory-mapping” feature that set this kind of display apart from the others being used at that time. I wrote up an engineering specification for this device, which I named “The Tom Swift Terminal, or, A Convivial Cybernetic Device” (Tom Swift was the hero of a series of boy’s books published starting around 1905 modeled after Thomas Edison, solving all problems through inventions). The idea was to create a design that would involve computer enthusiasts so that maintenance would not be a problem. I turned out copies of that spec on my mimeograph (look it up – it’s what we had for desktop publishing then) and sold it for 50 cents apiece to a small but growing crowd of personal computer enthusiasts. In late 1974 I published an article on it in an underground-style newspaper “People’s Computer Company”, which circulated to people who were interested in using computers with kids. Some time around April 1975 Bob had a talk with me in which he offered to pay me to design the “Tom Swift Terminal”. Of course, Bob wanted it designed his way, but I wanted the money and went for it. It was to be named the “VDM” – Video Display Module. I had never designed for a video output before, but I didn’t let that stop me – I had the practice of developing the specification already. The RS-170 monochrome video format was reasonably simple, specifically not requiring “interlace” of two “fields” of the scan pattern (or “raster”). While this produced a coarser raster pattern it simplified the timing of the synchronization signals. It helped that I had originally learned electronics through a castoff radio-TV repair correspondence course. The major architectural feature of the VDM was its “memory-mapped” architecture. Using two-to-one multiplexer chips (simple logic switches) the source of the data and address to the memory could be instantaneously switched between the display control circuitry and the microprocessor in the host computer. This meant that displayed data could be updated at radically higher speeds than other terminal circuits utilizing serial memory. As soon as the prototype VDM-1 was ready Steve Dompier began writing game software for it. His “Trek-80” game showed how much improvement came with the display technique. The predecessor, “Trek 73”, was written to run on timesharing computers with Teletype terminals and the “display” would be laboriously printed out as a three-by-three grid array showing the Enterprise in the center and the adjacent sectors’ contents. The player inputs a command from the keyboard and the terminal slowly responds with the next 3 by 3 snapshot of space. Trek-80, on the other hand, shows an 8 by 8 grid with dynamic activity going on all over, demanding real-time response from the player. The character generator ROM used in the VDM-1 included 16 symbol characters which were put to good use in Dompier’s game world. There are instrument-panel readouts changing all the time and a fuel gauge bar-graph. This was the beginning of computer games as we now know them, which has become one of the defining functions of personal computers. All this with a big cost savings, too! A personal computer with a memory-mapped display can seriously outperform a similar computer with a terminal connected, at the cost of the terminal alone. This is what the VDM-1 made possible. I maintain that it’s not a personal computer without a memory-mapped display – there’s no academic consensus on this definition, but if there were, I could claim credit as the developer of the personal computer architecture. There’s no prize for that, but it would be nice to have the credit. Immediately after completing the VDM-1 design (I’m still upset by the poor printed circuit layout done by their contractor and know I could have done better) Bob asked me to design a computer around the VDM-1 circuit. This was the Sol-20, which has its own story. Suffice it to say that Processor Tech opened the order book for the Sol-20 Aug. 30, 1976, when Apple was still working on the Apple-II. The Sol-20 was displayed for 17 years in the National Museum of American History, part of the Smithsonian Institution, alongside a plywood-case Apple-1 (Apple sold only the circuit board), as typical of computers that might be displayed at a club meeting in 1976. The two times I went back to revisit that exhibit I found the Altair and the Apple 1 on the table and the Sol moved to the floor (the table was a little too small for all three to fit comfortably). What – they couldn’t find a slightly larger card table?